Ho Ho Tower is a festive and amusing take of a very popular game provided by Elk Studios. Over the years, slot games offered by Elk have been winning over the hearts of the players. Continuing the tradition of making your festive season more amazing, Elk introduced Ho Ho Tower, the Christmas version of Hong Kong Tower with a few extra features. You climb up the tall, sky-touching towers and celebrate the bright festival with a breathtaking view. The backdrop of the game keeps popping throughout the game as the reels are transparent, hence you can have the best view of the game. You can play it on any online casino offering games provided by Elk Studios. As per the decent gameplay and an attractive outlook of the game, it wasn’t a surprise to know that the game has an RTP of 96.4%. It has hence become even more popular game by Elk Studios. The game has a total of 99 pay lines and 3 reels. The maximum win per spin can reach up to 1,530 times of the amount of the stake you start the spin with. Hence, the game attracts more players because of the drooling paybacks and exciting bonus features. Not failing to add the necessary Christmas punch to the traditional game, the symbols of the game include some delicious sweets which are Christmas specific, beautiful amaryllises flowers, the must Christmas tree and a shining bright golden numerical 7. The entire theme of the game is basically Christmas in Hong Kong and hence in the backdrop is visible tall skyscrapers and a top view of the sparkling city. There is a “Ying Yang” symbol as well that plays the main role in triggering a big bonus. Other than this, the symbol carrying the maximum payout is the numerical 7. It will further help in triggering another bonus of the game about which you’ll know more ahead. The game’s interface is user-friendly and thus it makes it easier for the players to understand what is happening in the game and how. You can also access the game manual from within the game under the help section. All the information regarding the symbols and game’s conduct are available in the manual itself. This will help in removing all the confusion. The mystery symbol is represented by an icy logo. The specialty of this mystery symbol is that it can transform itself into any of the symbols from the game. You’ve to wait for the reels to stop as only then the mystery symbol will reveal its identity. In case the symbol reveals a “Ying Yang” symbol of blue color, the next feature will get triggered which is known as the “Wheels of the Sky” symbol. One “Ying Yang” symbol, when revealed from the mystery symbol, is counted as 5 “Ying Yang” symbols. 3 Red “Ying Yang” Symbols: This will give you a free bonus game only. 4 Red “Ying Yang” Symbols: This gives you a bonus game along with an extra life. 5 Red “Ying Yang” Symbols: Here, you get a bonus game along with two extra lives. Now, if you’re wondering what these lives are for, it is the bonus game you are looking at. To make the bonus even more interesting, the bonus game has three different levels with three different wheels and increasing cash prizes at every level. Whenever you clear a bonus level, you move on to the next level. If you don’t, you can use a free life to continue with the game. You can keep playing the game until you don’t reach an empty section or when none of your free lives remain. Once you run out of lives and the moment you touch an empty slot, the bonus round is over. Each level of cash bonus has a higher value. 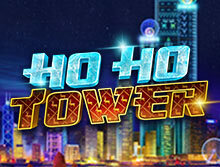 Ho Ho Tower slot by Elk studios is an interesting playing option for the online slot gamers. You get a chance to win huge prizes in a different manner. The game hasn’t left any chance to disappoint the players and thus aims at providing the best gaming experience with a beautiful Christmas effect. It is thus a worth trying slot game.